At Children’s Garden Day School, we pride ourselves on providing the Hamilton, NJ area with world-class day care and preschool services and world-class early education. 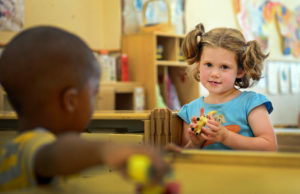 Each day care and preschool curriculum is designed to introducing children to skills they have yet to develop, while enhancing and improving upon early progress and enhancing strong foundations. As students grow, we continue to thoughtfully expose them to new and exciting intellectual, physical and emotional challenges through a myriad of achievable milestone-based activities. Because preschool children are eager to learn and soak up knowledge, our curriculum seeks to familiarize learners with the world that surrounds them – but always on terms and at a tempo suited to the child’s natural maturation. Teaching at your child’s pace, creates a learning rhythm as integral to the learning process as the lesson itself. After all, if the educational process is not tied to the learner’s strengths, than the educator has failed, not the learner. 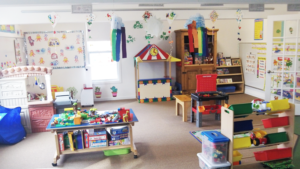 At Children’s Garden Day School, this is our mission: to deliver superior Hamilton, NJ preschool education and day care services that always stay mindful of your little learner’s unique and evolving needs. Please take a moment to browse our programs below. If you have a question, please feel free to schedule a call to discuss your needs with our director. Our seedlings, like their counterparts in nature, are consumed with the desire to soak in as much nutrients and learning as their ever-growing bodies can manage. Every day is a new learning experience – a new discovery – as your child gets to know and master their new surroundings. They will thrive as their needs for new knowledge emerge and are met. And as they learn to socialize and engage the world that surrounds them, they will also learn exciting and fascinating new ways to communicate creatively and effectively with their instructors and fellow students. Your little learner will revel in one opportunity after another to vocalize with words, using combinations of words, while improving nonverbal methods as well. Your child will develop thrilling ways to associate words with pictures and follow instructions too. The experienced, caring and nurturing faculty will ensure that your child’s needs are met throughout the day and throughout his and her development. Our sprouts will learn how seedlings take root and intertwine with all the other children and teachers in the classroom. As a Sprout, it is time to gain experience becoming part of a group. Children will learn about sharing, taking turns, empathy, making friends and will continue to improve their language development. Coloring and painting will strengthen the muscles and introduce achievable motor skills milestones that will later be used to begin exciting new writing exercises. Boys and girls will become exposed to printed materials as a means to get them ready for reading! Your little learner will begin to understand the many fun and interesting ways that words are associated with pictures. Each child will be guided towards independent self-care, which includes exciting milestones such as potty training, pulling up pants and washing hands, to name only a few! The daily schedule, dedicated faculty and pleasant environment provide a comforting atmosphere for your children to begin developing their independence, autonomy and self-esteem. Your little buds have been growing, learning, and discovering! And now they are excited to share everything they know with their friends. We will continue to develop and model empathy during this stage in your child’s development. We will focus on unstructured, imaginative play, which helps learners develop language skills. We will practice writing – not only on paper, but through the use of other materials such as sand, sugar and even shaving cream! Through the use of big books, your child will begin to understand that words do not change, but remain the same each time they are read. Beginning word sounds and recognition of rhymes will be taught to ensure long-term reading success. Little learners will begin to understand numbers and counting in everyday use. They will begin to learn organizational skills as it applies to projects, crafts and playtime – from start to cleanup. Children are fueled by the desire to explore any new avenue or undertaking they can find. The teachers at Children’s Garden Day School design activities and lessons to peak your children’s curiosity and make learning fun! Our budding Boys and girls will be encouraged to help one another explore and learn together, teaching them to cultivate and foster their new socialization skills. Our blossoms are really shining now! They have grown and learned so much already, but their thirst for more answers is unquenchable. We are ready to answer the numerous Why, Why, Why questions and have devleped new and challenging activities and social interactions to cultivate new questions. Children’s Garden Day School incorporates the New Jersey as well as Nation-based Core Curriculum Content Standards for preschool education and our experienced faculty prepare your children for their advancement to kindergarten. Identifying the starting sounds of words, comprehension of printed material and recognizing rhyme will prepare your child for early reading success. The concepts of handwriting and letter formation will be introduced in preparation for kindergarten writing, in addition to beginning phonics and word recognition. Age-appropriate technology will also be utilized in the classroom. Health and physical education basics will be introduced. Increasing attention span, understanding rules and following direction will be emphasized. Concepts such as empathy, patience and tolerance will be further developed and modeled. Counting, comparing and recognizing mathematical concepts will be broadened along with observing, investigating and exploring to grasp science and social studies concepts. The Blossom’s curriculum will be linked through creative arts such as music, dramatic play, visual arts and dance making learning fun!